Co|So is currently full of Holiday spirit! From the wreaths hanging in the entrance of the gallery to the Christmas lights outside, to a collection of festive works, coming to Co|So will have you feeling bright and cheery in no time. There are still a few days left to see our Holiday Small Works show before the gallery closes from December 25th – January 1st. Below are some holiday themed works of art on display at Co|So! A new member to Co|So, Kara Bigda’s mastery of the watercolor medium can be seen in her works currently at the gallery. From the detail of the red bricks to the delicate attention paid to the wreath hanging on the door of Deerfield Academy, this piece is a must see! Kara Bigda will also be taking part in the New Members show which opens on January 10th. Another painting rendered in intricate detail is Marieluise Hutchinson’s Christmas Snow. Marieluise Hutchinson finds the source of her inspiration in the seasonal character of New England. She often records the fields and farmlands of rural America. 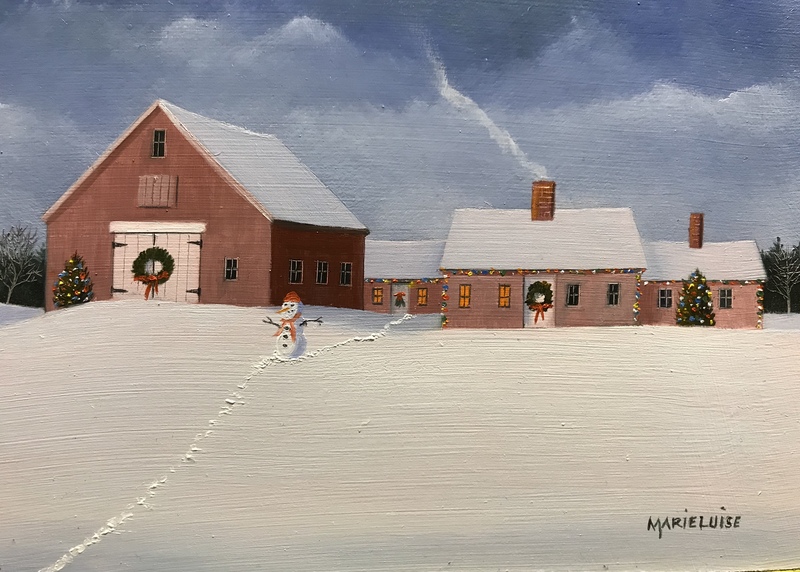 This painting follows the rustic theme, and adds Christmas cheer and a welcoming snowman. Rose Leitner is a gestural painter who transforms an emotional or visual concept into its abstract essence. In her painting, Steppin’ Out the blue and white strokes of oil paint remind us of the colors of the Festival of Lights. Co|So hopes everyone had a beautiful Hanukkah this year! Andrea Petitto plays with texture and subject in her oil painting, Tea for Teddy. The teddy bear looks comfy on the blue chair, snuggled up in a cozy red sweater and green beanie, ready for his cup of tea. This small work is a great holiday reminder, and would also look great above your favorite armchair! Susan Hollis’ small work of painterly Christmas decorations is sure to bring you holiday cheer. She paints Mr. Claus himself, wrapped in gold tinsel, heading out to deliver presents to all the girls and boys of the world. Stop by Co|So now through December 24th to see these amazing, holiday-inspired paintings in the gallery!